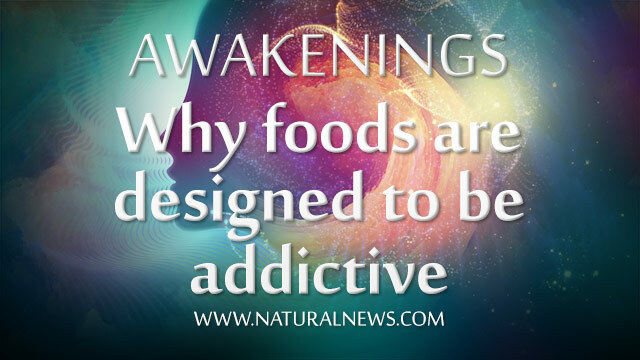 (NaturalNews) My latest episode of Awakenings exposes the truth about how the manufactured food industry is engineered to keep you addicted, not nourished. • The food supply is not designed to keep you nourished. Instead, the food supply is designed to keep you addicted. • It is widely agreed that commercial corporations exist to maximize profits, not to serve the greater good of humankind. The food industry is no different. • Food industry profits are maximized by leaving food consumers deficient and hungry so that they crave the same nutrient-deficient foods over and over again. • This is why foods are heavily processed to remove nearly all key nutrients such as minerals, fresh oils and phytochemicals. • Foods are engineered to invoke brain chemistry patterns of addictions by using chemical additives. • Why your body experiences extreme cravings when it is kept in a state of nutritional deficiency. Popular foods are engineered to worsen these deficiencies. • The nutritive minerals removed from processed foods are fed to farm animals in order to promote their health and prevent their disease. • Cravings are your brain's way to motivate you to locate and consume the nutrients you're missing. But processed foods don't contain those nutrients! • The dark secret of food companies: The more they take out of the food, the more you'll keep buying in a fruitless effort to satisfy your cravings. • Why food company profits would be crushed if their foods were rich in nutrients.